SEPPA is a world leader in complete line solutions with over 30 years of experience in processing and packaging equipments for Water, Sparkling water, CSD, Juice, Milk, Beer, Liquor and Wine with a state of art Design, Production and Sales-service centers in India, USA and Middle East, Africa and Australia to deliver multi- product solutions. SEPPA supports its customer from concept, design to product to stay ahead of competition and on top of consumer and market trends. SEPPA is one stop shop for all your requirements and partners your growth. SEPPA is involved from concept to consumer with you to ensure your success all the way. We innovate and design the most aesthetic packaging for your product and also ensuring the lightest most economical bottle. SEPPA introduces the most sophisticated post packaging protection for the product. We focus on bottle and product durability and enhanced hygiene to ensure optimum quality of your product to the consumer. With a 24/7 call center to support your service, maintenance, up gradation and training needs. SEPPA offers enhanced hygiene line solutions for your sensitive products. Kombopure® combines the blowing and filler and capper into one integrated block. This spirals hygiene, production efficiency and product quality. 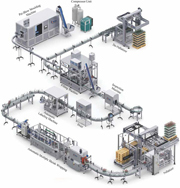 SEPPA is a single source manufacturer offering integrated complete line solutions for Water, Sparkling water, CSD, Juice, Milk, Beer, Liquor and Wine. Vertical integration through acquisitions combined with 30 years of expertise and knowledge in complete line solution places us clearly above industry competition. Our core strength lies in designing customized plants and lines with the use of cutting edge technology. SEPPA's is the global leader in processing and packaging technology and one of the few companies in the world which designs and manufactures a complete range of processing and packaging equipments and technology under one roof. SEPPA’s mission is to offer clients a seamless transfer of high technology with high quality through our advanced products and systems. Understanding our client’s 3 C’s, Challenges, Constraints and Competition enables us to offer turnkey project solutions and expert advice on enhanced hygiene productivity, maintenance and maximized efficiency. SEPPA has the infrastructure and expertise to design, develop and manufacture customized plants based on the client’s requirements. SEPPA is the only company which provides a complete line solution for Water, Sparkling water, CSD, Juice, Milk, Beer, Liquor and Wine projects.